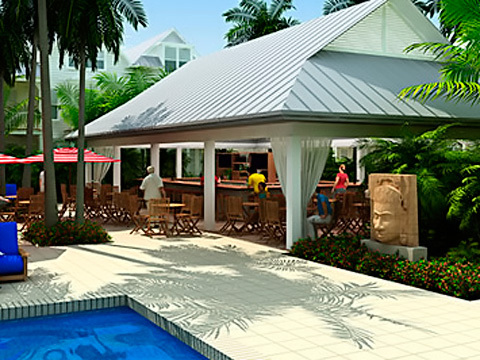 Key West's Newest Luxury Beach House Resort Now Open! See what our happy guests have been saying! Endless sunshine, natural beauty, and glorious sunsets. Welcome to Parrot Key Beach House Resort, Singh Resorts' newest Florida Keys luxury resort, located just minutes away from the historic district of Old Town in Key West. This Key West luxury resort brings Singh Resorts' signature beach house resort setting to Key West for the first time, redefining luxury accommodations in the historic Florida Keys city. Located among five acres of lush topical landscaping and palm groves, the exclusive Parrot Key Resort features the traditional detail and character of classic Key West "Conch-style" homes, with shade dappled front and back porches that overlook the water and spectacular sunsets. This magical island paradise surrounds four private swimming pools nestled in a garden paradise, as well as white sandy sunbathing beaches by day and the eclectic happenings of Key West by night. Just outside your front door you can enjoy Key West casual restaurant dining and refreshments from our poolside cafÃ© and Tiki Bar. Enjoy a great Florida Keys fishing or watersports adventure, or host an event at our Conference Center. Each of our Key West luxury resort's 74 spacious, one, two and three bedroom, three story and three and a half bath luxury beach houses come with the finest amenities, including gourmet kitchens, first and second level private porches with waterfront views, 42 inch plasma TVs in the living rooms, premium cable service, DVD/Stereo systems and original art inspired by the Florida Keys. Resort Amenities include: * 74 classic Key West style beach houses, each beautifully appointed with one, two and three bedroom and three and a half baths * 4 private swimming pools * Private white sand sunbathing beaches surrounding 2 sides of the resort * 24-hour security allowing for privacy and comfort * Daily housekeeping services * WI-FI high-speed Internet access property-wide * Sculpture gardens * Spa services * Full service 1,512 square feet of meeting and event space, perfect for intimate Key West meetings and conferences * Casual Key West restaurant poolside dining in a lush tropical garden setting at the resort's Parrot CafÃ©. * Tiki beach bar * Adventure Concierges for fishing, water sports, and many other recreational activities * Concierge services * Access to the amenities offered at all Singh Resorts properties * Click here for full information on Parrot Key Beach House Resort Located along the waters of the Florida Bay, The Parrot Key Resort will offer something for everyone. Whether you make yourself at home in our Key West vacation rentals in the Florida Keys on vacation or visit for business, our setting is unrivaled. Our dedicated staff and concierge service will be available to ensure a wonderful island experience in a luxury beach resort that is amazingly unique. So come join us at the Parrot Key Resort, and let us make you feel at home. In order to preserve your vacation experience in the paradise of the Florida Keys, all Singh Resorts are 100% smoke free environments, both indoors and outdoors.